“Hi folks, Jon Wennstrom here! It’s time for another Saturday Shout Out! Each week I’m giving a shout out to an educator that has inspired me, challenged me, or helped me out along the way.” With these words, I start a short video each week to show my appreciation for an educator who helped shape who I am today. The first time I saw green screen technology, I had a vision of this project. It took me a year to get to the point where I could create and send out these short messages. The videos are 30-40 seconds in length and are a quick nod to my Edu-Heroes. For the past 22 weeks, I have sent out “Saturday Shout Outs” and I’ve been amazed at the responses I’ve received. About a month into the project, I was approached by a PTA member who casually mentioned that she loved the weekly shout outs. I was surprised, because I didn’t know she had seen any. Several weeks later, I was at a district meeting and a secondary principal (who I didn’t even know was on social media) told me he thought the shout outs were great. Obviously people were enjoying the messages. Next, I was out for dinner and an educator came over to me and joked about when he was going to get a shout out. Again, this was someone that I didn’t even know had seen the videos. Most recently, I received a call from a friend and educator in New York who said this was something really special. I was shocked at the impact that had come from what started as a simple thank you message. As educators, we often do little things that may never be noticed. Coming in early to set up the classroom for a special project, helping a child who needs their shoes tied, or simply covering a classroom, so a colleague can use the restroom. But guess what? Someone is ALWAYS watching. I recently read a blog post where a teacher said he always picks up items in the hallway, because he saw his principal do this (when no one was looking) and he remembered it still 20 years later. The rocks of kindness we through into the pond of life create ripples that reach farther than we could ever know. Little things do matter and can make a big impact…even a simple thank you! Thursday, February 14: Staff Meeting 8:05 AM, Valentine’s Day! Monday, February 18: No School for President’s Day! January 24, 2019 jonwennstromLeave a Comment on Don’t Wait…Act Now! It’s late at night. You can’t sleep. As you flip through the channels you see people enthusiastically sharing the latest and greatest product that you just can’t live without! From Ginsu Knives to George Foreman Grills to comfy Snuggies, you can find it all with the ubiquitous late night infomercial! Amazingly, the late night infomercial market generates billions (yes, billions with a B) of dollars each year. Now, as fun and quirky as many of these products are, it’s the salespeople that really make the magic happen. They shout, they sing, they dance, they make you feel that you can’t live without this product and time is running out to get it. “Don’t wait…Act now!” Don’t believe me that they’re effective? The late night infomercial market generates billions (yes with a B) of dollars each year. Infomercials are still around, because they work! The infectious enthusiasm of the presenters translates into sales for the company and influences the viewers (you and me) to buy things we didn’t even know we needed! It’s a true testament to the power of positive energy and enthusiasm. As educators, we can learn a lot from infomercials. What if we took that same level of enthusiasm and positive energy and applied it to our lessons? What if made our content seem indispensable to our students? What if the atmosphere in our classrooms told our students “Don’t wait…Act now!”? The results could be amazing and our school could be a place of excitement and wonder for students. Talk about Energy & Enthusiasm!! 3:00 PM: “That infomercial is ridiculous. 3:00 AM: “That infomercial is genius. I’ll take 12! Last week, my youngest daughter came home from school devastated. She had auditioned for her first high school theater production and did not receive a part. While trying to comfort her, she told me that I didn’t understand because I always succeeded in everything I did and referred to some of the lead roles I had played in theater productions. While she was right about me being fortunate in some of my acting roles, she didn’t have a clue about how many times I have failed in my life. I started to question myself and wondered if I had only focused on the successes while talking with my daughters. If they really knew me, they would know that any success I’ve had is because of my MANY failures. Let’s take a walk down memory lane. Wrestling: This sport was my life in high school. My ultimate dream was to earn a medal at the state finals. When I went to the state finals my sophomore year, my goal seemed to be within reach. Even though I promptly lost my first two matches, I knew the next year, I could make it happen. My junior year ended in sickness (probably from extreme weight cutting) and being eliminated at the district level by someone that I had beaten several times during the year. My senior year saw a return to the state finals where I made it to the final eight. Medals were given to the top six. I was a two time state finalist who considered himself the biggest loser. Coaching: When I started teaching, my district was in the process of starting up a wrestling team and asked if I would serve as the head coach. Creating a team from scratch was hard enough, but I was a first year teacher who worked at the elementary trying to recruit at the high school. Luckily, the football coaches befriended me and helped me out. Our first several years as a wrestling team was brutal. Our team was tough, but inexperienced. We had a lot of heart and very few wins. As far as I was concerned, we had the best team in the world, even though on paper, we may have looked like the biggest loser. Career: After several years as a teacher and then elementary principal, I was offered the position of Chief Academic Officer at a small private college. Against the advice of people that I should have listened to, I left the public schools and took the position. It sounded prestigious, but in reality, the position was not for me. In fact, I was terrible at it. I dreaded coming to work each day and was perpetually unhappy. Three years into the position, I had lunch with the president and he said something that I will never forget. “Jon, I just don’t think it’s working out.” I was stunned. As lousy as I was at my job and as unhappy as I was, I still couldn’t wrap my head around the fact that my contract was not being renewed. Ironically, this traumatic event led me back to K-12 education and back to the job that I loved best in the world…an elementary school principal. I am thankful to have had the opportunity to find out what my true calling is, but during the time that I was waking up to that call, I spent three years feeling like the biggest loser. Marriage: This was a hard one to reflect on. I’ve always considered myself a “family first” person and to have failed at the relationships that matter most was devastating to me. For years, I felt embarrassment and shame at having a failed marriage. I also felt like a hypocrite for telling people to focus on their family first, when it was something that I clearly didn’t do. However, I’ve come to learn many valuable lessons. I’ve learned that relationships can’t be neglected, that people can still parent together from separate homes, and that second chances do happen. Even if, you once believed you were the biggest loser. PhD: Do you know what the letters ABD stand for? Someone who has participated in a doctorate program would tell you that it means “All but dissertation” and that they know many people who have this title. Well, I am one of them. At the time of my enrollment in the Educational Doctoral program, we were told that 50% of participants leave before they finish their coursework and of those that remain, half do not finish their dissertation. I fell into the second group. I completed my coursework, and took my comprehensive exams (comps), but failed to complete my dissertation. Life happened along the way and I became a well educated, biggest loser. It’s funny how my daughter (and probably many others) only see the successes. In her mind, I simply wished for something to happen and made it so. Perhaps that is my fault. Maybe I didn’t spend enough time talking about learning from failure and how the glory is in the fight and not the outcome. Well, this post is to let my daughter know and those who I have been fortunate enough to connect with in my life, that at many times in my life I have been the biggest loser…and I’m a better person for it! January 10, 2019 January 10, 2019 jonwennstromLeave a Comment on Excelsior! Not long ago, the comic world lost one of its greatest artist, Stan Lee. Before his passing at the age of 95, Stan Lee had been the founder of Marvel Comics and created such characters as Spider-Man, The Incredible Hulk, Iron Man, X-Men, Fantastic Four, Black Panther and many more. In addition to his creative genius, Lee was noted for his robust sense of humor. Some of that can be seen in his more than 20 cameo appearances in the Marvel movies. During an interview spanning his groundbreaking career, Stan Lee stated that he never liked spending time on past accomplishments, but rather prefered to focus on upcoming projects and new opportunities (this was when he was in his 90’s). At some point during his career, Stan Lee started using the word “Excelsior!” as his tag line. The word originates from Latin and means “ever upward” and came to be a symbol of his quest for excellence. Recently, I purchased a comic book that ended with a full page dedication to the memory of Stan Lee with the word “Excelsior!” Now, this would be expected in a publication from Marvel Comics that he helped found. However, the tribute was from DC Comics, the rival company. DC was paying tribute to someone who had made their comics better by raising the bar for everyone. Stan Lee had transcended the world of comics and had become an inspiration to artists and dreamers around the world and the embodiment of continuous progress. As an educator, I want to follow the example set by Stan Lee. His creativity and originality led to the birth of some of the world’s most enduring comic heroes. I want to use my creativity and originality to make my school a fun and inspiring place for students and staff to grow in. His sense of humor helped put people at ease and made generations of people (even those that never met him in person) feel like they had a friend and mentor. I want to remind my team to laugh and to always take our job seriously, but never ourselves. Finally, his philosophy of continuous improvement is something that I want to model for my staff, encourage for my students, and live each day as an educator. Thank you, Stan Lee for so many great memories, but also for teaching us to always work on creating a better future. Excelsior! For the past five years, I have chosen “one word” to serve as my focus for the year. When selecting my word, I usually think about what I want to focus on, listen to what words others are using, and then settle on my word. This year, our family was chosen to light the advent candles for our church. As we stood lighting the candles during the readings, I knew then, my one word for 2019 would be Light. Specifically, three aspect of light would be my focus. Seek the Light: Recently, my pastor shared a story of a time when she was in northern Scotland. She had decided to ride her bicycle into the countryside to a place that was noted as a prime spot to view the northern lights. As the ride continued, the sky grew darker until soon she was completely lost in the darkness. She stopped peddling and knew she needed to make a decision. Should she turn around and head back to the safety of the village or continue on in the dark? After a brief pause, she decided to continue on. A short distance later, the path turned a corner and she beheld the beautiful sight of the shimmering aurora borealis and had an experience that would remain with her for a lifetime. Sometimes, we need to go through the darkness in order to find the light we are seeking. This year, I will remember that when times are dark and situations are bleak, light and beauty may be right around the corner. Be the Light: We all have had people in our lives who are filled with light. They inspire, they encourage, and they show the way with the light they give. That’s the person I want to be! I want light to shine through my social media posts, I want light to shine through my interactions with others, and I want light to shine through everything I do. Once we find the light we seek, we need to become the light to shine brightly for those around us. Being dark and negative is easy…it takes work and courage to be light. Share the Light: There is a saying that lighting someone else’s candle does not dim our own light. I believe that is true and I have found that every positive thought I’ve shared, every kind word I’ve spoken, and every kind act I’ve done has always come back to me many times over. My goal as an educator is not to show people the way, but to help them find their own way. That’s what sharing the light means to me. When I seek out my one word for the year, I always try to find something that rings true to me. For me, truth is speaking or hearing something that we already know in our heart. The word “light” rang true for me and will help guide me through 2019. What will your one word be this year? Both of these books on Teacher Self-Care by Dan Tricarico are available in my office for Teachers to borrow! I grew up with the Rocky movies. Each time I watched one of the movies, I left the theater inspired to start working out and even got boxing gloves one Christmas so my friends and I could reenact our favorite boxing rounds. Recently, I watched the new CREED movies with my daughters and saw the character of Rocky through a new lens and came away with some leadership lessons for educators. Go The Distance: People often forget that Rocky didn’t win the fight in his first movie. As an unknown underdog facing the heavyweight champion of the world, he wanted to do what nobody had done before…go the distance. No boxer had ever gone fifteen rounds with Apollo Creed and Rocky’s determination and heart made him the first to do so. In every way that mattered, Rocky “won” the fight, even though he didn’t win the title. As educators, it’s not about winning awards or having a fancy title. It’s about showing up every day, staying focused when times are tough, and going the distance for our students! Just Love ‘Em: Other than his wife Adrian, who provides him with love, support, and wisdom, the rest of Rocky’s relationships are more complicated. His best friend, Paulie, is obnoxious, lazy, and even abusive at times. Yet, Rocky loves him, forgives him, and even inspires him by his example to improve his own life. His trainer and mentor, Mickey, originally discarded him and told him he was a “waste of life”. Again, through forgiveness and patience, Rocky formed a life-long bond with his trainer and gained a father figure. Finally, his best friend, Apollo Creed, was once his mortal enemy. From competitors (Rocky I & II) to allies (Rocky III) to steadfast friends (Rocky IV), their relationship evolved as they learned and grew. Rocky is a great example for how we should treat difficult people in our lives…just love ’em. It’s not always easy, but he shows that letting go of anger, embracing forgiveness, and always assuming best intentions makes our path easier and may turn a competitor and even an enemy into a partner and friend. Have A Soundtrack: Let’s face it. If you have seen the Rocky movies, it’s almost impossible to think of the character without humming the iconic soundtrack. The combination of music and seeing Rocky train for his big fights is what pumps up the audience and makes us all believe (at least for while) that we can conquer whatever challenges lie before us. When I walk into school each day, I don’t want to drag myself in like I’m tired and exhausted (even if I am). I want to come in like I’m walking in with my own theme song. 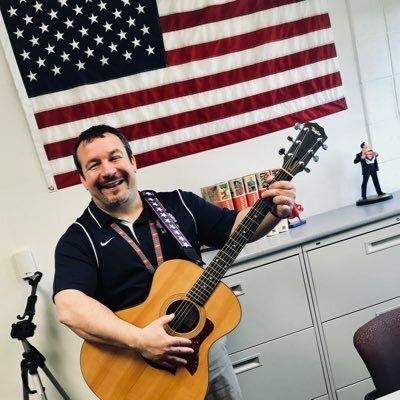 The next time you walk into school or your classroom, do it like you have your own theme song that announces “I’m here and ready to go the distance!“. It’s All Heart: Perhaps the biggest similarity that educators share with Rocky Balboa is heart! Rocky is all heart and always gives it everything he’s got. That’s how he is able to go the distance and beat his opponents….he keeps going when everyone else quits. As educators, we train to be our very best, we dedicate countless hours to find ways to help our students, and most importantly we never give up on them! It takes a lot of heart to be a champion like Rocky, it takes even more heart to be a champion for kids! Once a month, the Compelled Tribe of Ed Bloggers has a common theme. This month happens to be traditions as we are preparing for the holiday season. I thought long and hard on this one, because I realized that I don’t have as many family traditions as I wish I had. As a child, I longed for a Thanksgiving and Christmas scene like I thought every child had. The image in my mind for the holidays looked like something from a Norman Rockwell picture. With a dad who was often in the hospital for kidney disease and a mother who worked swing shifts at the hospital as a nurse many holidays, our family traditions often fell short from my ideal. When I grew up, I was bound and determined to make that Norman Rockwell image a reality with my own family. However, a divorce and split custody of my children shattered that dream as well. For many years, I lamented the fact that I would never have a normal holiday with my family. Later I realized, there is no such thing as a normal holiday and that the Norman Rockwell picture was just that…a picture of what people wished for. I bring this up because many of our students may feel that their home situations are “different” and that no one else could understand their situation. That’s where we step in as educators. Part of our job is to help create school traditions and routines that create a safe, secure, and fun environment for our students, especially during the holiday seasons. More importantly, we need to help them realize that their family traditions or customs are okay and that there is not a perfect or correct way to celebrate the holidays. The older I get, the more I realize that I did have fun holiday traditions with my family. We always ate a meal together (even if it wasn’t on the holiday) and we often watched a movie (usually Ben-Hur for Christmas). When I see old movies playing during the holidays, I often think of my dad and realize we had fun traditions after all. Most importantly, I always felt loved and safe at home. That’s a tradition that I have passed along to my children (even with juggling holiday schedules between two households). So, I guess the most important tradition of all…being together and being happy as a family is a legacy that has been passed on from one generation to another. As educators, our students may have many traditions or no traditions at all. But we can help make traditions and memories here and we can certainly make sure they feel safe and loved while at school. The hugs you give, the smiles you share, and the words of encouragement you express may be the one thing they hold on to during their holiday season. Let’s make sure that with all the traditions we have at school that kindness, patience, and empathy are woven into each of them and demonstrated to all students. Friday, December 21: iReady Window 2 Closes, Carols in the gym 3:15 PM, Staff Celebration after school at B. L.
Recently, I attending the annual MEMSPA (Michigan Elementary & Middle School Principals Association) conference. While there, I had the chance to connect with over 500 educational leaders from across the state. The keynote speakers each gave a needed bit of wisdom. Sean Covey, our opening keynote, gave a presentation designed to improve our practice. MEMSPA executive director, Paul Liabenow, and chief deputy superintendent of MDE, Sheila Alles, gave an update of the state of education in Michigan and shared a vision of where we are going. Kim Campbell showed the importance of keeping a healthy sense of humor as educators and closing keynote speaker and author, Jimmy Casas, inspired us to lead courageously from the heart. In addition to the keynotes, there were many inspirational breakout presentations led by principals sharing out best practices and innovative ideas. There is a saying that “Iron Sharpens Iron” meaning that we sharpen or improve ourselves when we associate with people who push us and encourage us to be the best we can be. For me, the MEMSPA conference is a perfect example of this. Here are some ways that I was “sharpened” through my time at the annual conference. New Ideas: With each new session I attended and each new speaker I heard, I gained new ideas or insight for doing the same things in a slightly different way. When we fail to connect with others, we are limited to our own ideas and experiences. I’ll be the first to admit that most of my best ideas, weren’t my ideas! They were from mentors, authors, speakers, and colleagues that shared an idea that I adapted to my own practice or building. As many have said, “The smartest person in the room is the room“. Challenge My Thinking: Some of my favorite educators and some of my best friends are those that challenge my thinking. As much as I love it when people agree with me or tell me I had a great idea, I gain more insight from those that stretch my thinking or challenge me. I’ll never forget the time that I was sharing out why an idea would not work, when a friend and colleague pointed out to me that I was focusing on barriers and not solutions. Jimmy Casas reminded us in his presentation that educational leaders should never be “the lid”, but should help find ways to make things happen at school! Inspire: My “Why” in education is to inspire others. I want to inspire teachers to be the very best they can be, I want to inspire students to reach their full potential and I want to inspire all educators to find or reignite their passion for their calling in this noble profession that we share. To inspire others, I need to remain inspired myself. How do I do this? l read books from inspirational authors, I associate with friends who encourage me to be the best version of myself, and I attend conferences (like MEMSPA) to “fill my bucket” with inspiration. Connect with the BEST: Spending several days with principals from across the state is energizing, but these are not just any principals. The principals who attend the conference are those that have chosen to improve their practice, take a risk and present in front of their peers, and are open to new ideas. They are the movers and shakers in our profession. In my opinion, they are the best of the best! That’s who I want to learn from, interact with, and be like. Now there are many great educational leaders that do not or cannot attend the conference. But the ones who are there have made a conscious choice to learn, share, and improve! It has been said that we take on the traits of those we surround ourselves with. If that’s true, I’m glad to be surrounded by my MEMSPA colleagues! Getting “sharpened” at the annual MEMSPA conference is only the first step. Once iron is sharpened it needs to be used. Now comes the next step of taking what I’ve learned and using the inspiration I’ve received and applying it to my own practices and sharing with our building team. I hope I can continue the process of iron sharpening iron and help ALL those I work with to find their inspiration and be their best! It’s interesting to me that his simple response was all she needed to hear. A friend implies that he is here to help, that she doesn’t need to be afraid, and that he cares. In fact, even his name is not given. His role and his actions were what was important. I think of how many times that we get caught up in titles, names, and credentials, when what’s really important is what we do and how we act. In this case, it was the role of “A friend”. As educators, we all have names, credentials, and titles. Those may mean a lot when giving a presentation, going to a conference, or publishing a book, but our students aren’t interested in any of that. They want to know if we will be a guide, a mentor, and even a friend. All of these roles can be summed up in the word “Educator“. When I think of the best educators I’ve worked with, all these roles all apply. There’s power in the word educator, because it embodies all the best traits students look for and deserve. I hope that when students, staff and parents think of me, they will look past the titles and credentials and know that I am an educator who is here to serve and here to help. Each year during the Thanksgiving break, I write a post of gratitude. Often I reflect on the moments and people in my life that have helped shape who I am today. However, this year, I want to be completely in the moment and share out my gratitude for people and events that I’m grateful for right now. Right now, my daughters are young adults that are busy with their high school activities, work, and friends. I’m thankful that on Thanksgiving morning, they took the time to wake up early and go with me into Detroit to serve with Meals on Wheels. Right now, I’m exhausted but happy that my friend and fellow principal, Lawrence, took me to a rock concert last night as a thank you for serving as a mentor to him. I’m thankful that we have the opportunity to connect both at work and outside of work. Right now, I’m reading the book “Uncommon Leadership” by Debbie McFalone. I’m thankful for the inspiring messages and straightforward advice the book gives and the same messages and example that are given by Debbie each time I see her. Right now, I work in a district where I feel empowered as a leader and in a building where I feel joyful to come to school every day. Our jobs are never easy, but always worth it. I’m thankful that we support one another through tough times and celebrate the good times together. Right now, I’m feeling good that I’ve lost nearly 20 pounds since the start of the school year. I’m thankful for those that have supported and encouraged me and I’m praying for willpower through the holiday season to stay active and healthy! Right now, I’m writing a blog post on gratitude that I will share with our Buchanan staff and also with my friends in the Compelled Tribe of ed bloggers. I’m thankful for the team of educators that I work with each day and for the team of educators that I’m able to connect with in my Professional Learning Network online. We all have wonderful memories that we cherish and experiences that we are thankful for. But take a moment to look around you and stop, smile, and share what is good in your life at this very moment. What are you grateful for right now?